Dan's Motorcycle "Change your oil Page 2"
¶ Now we come to oil levels. Every engine needs a certain amount of air space inside the engine. If you put in too much oil, it cuts down on this air space and increases the engines internal pressure. This can cause an engine to smoke or blow out oil through the seals and/or engine breather. If you put too little oil in, you blow up your engine, so you had best be accurate in the amount that goes in. One way is to look in the shop manual. It will normally give two amounts. One amount for if you have changed just the oil and another amount for when you change the oil AND oil filter. Sometimes there is a third amount for when you have rebuilt the engine and it is totally oil free. Most engines will have some way you can easily determine the right oil level without draining the oil and putting in an exact amount. This is usually done in one of three ways. All checks are done with the bike straight up and down, usually on the centerstand. The Oil Level Dip Stick is simply a stick that screws into the side of the engine. 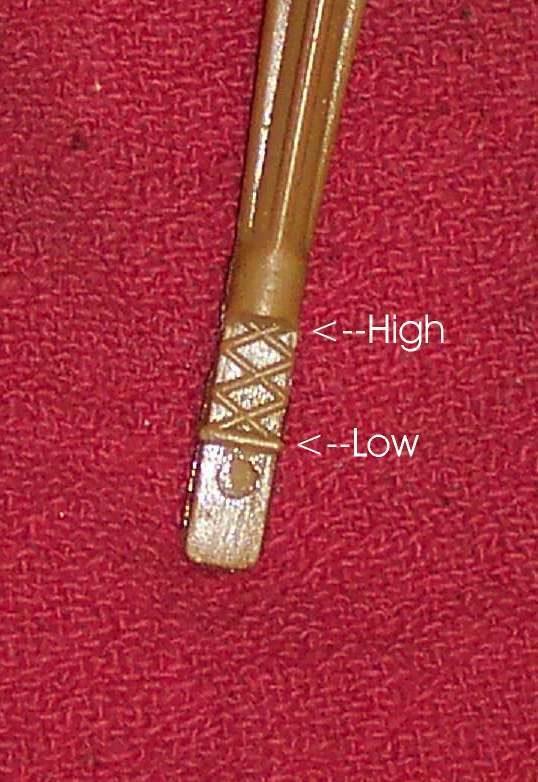 It has high and a low marks on one end. Take the Dip Stick out. Clean all the oil off it and insert it back in it's hole. Do not screw it in. Now remove it again and look at the lower end. The oil should be between the High and Low marks. If it is low, add some. If it is high, take some out. 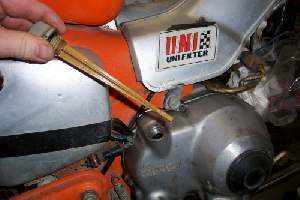 The majority of bikes out there have an Oil Dip Stick to check their oil. 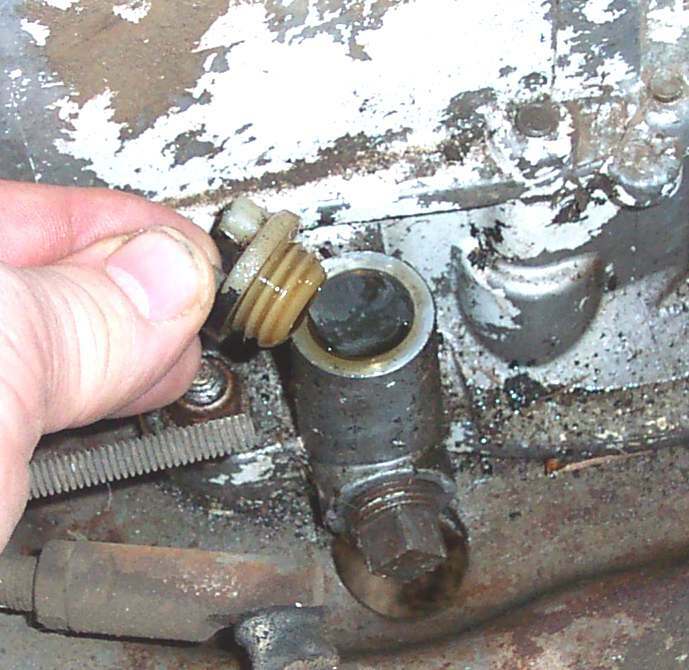 An Oil Level Plug is simply a threaded hole, in the side of the crankcase, that is at the proper oil level. 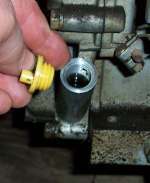 Remove the plug or bolt and add oil till it starts to come out the hole. Put the bolt back in and you are done. A lot of race bikes, and some small street bikes, use this method. 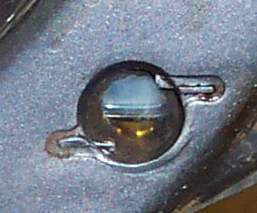 An Oil Sight Window has a clear plastic window cast into the side of the crankcase. There are high and low marks on or near the window. The oil level must be between these marks. Add or drain oil to make it so. A lot of street bikes have started using this method. It works good till the plastic starts to discolor, and you can't make out the level easily anymore. Another potential problem is, believe it or not, clean oil. If the oil is clean and the level a bit high, it may look like there is no oil in the window. You add more, still no level in the window, so you add still more. To prevent this, let the bike lean a bit from straight up and down. The real level should show up in the window. If it does not, add a bit more and lean it again till you find the real level. If worst comes to worst, drain ALL the oil and refill with the correct amount (It's given in both the owners and shop manuals) and check the window again. 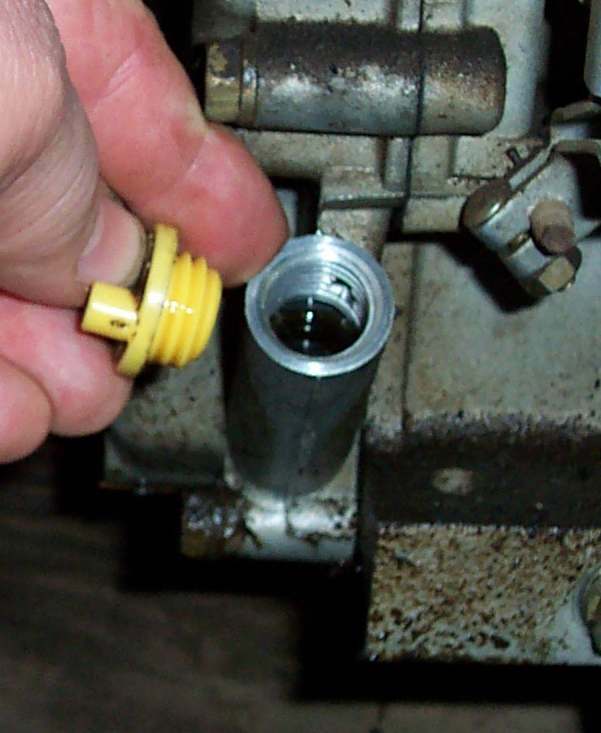 If you have a small mini bike with a Briggs and Stratton or Tecumseh engine, without a dip stick, you usually fill up the oil to the threads on the oil fill hole. It is a good policy to put all the oil you can possibly get in to it, without it over flowing too much. This applies to both Horizontal and Vertical engines. 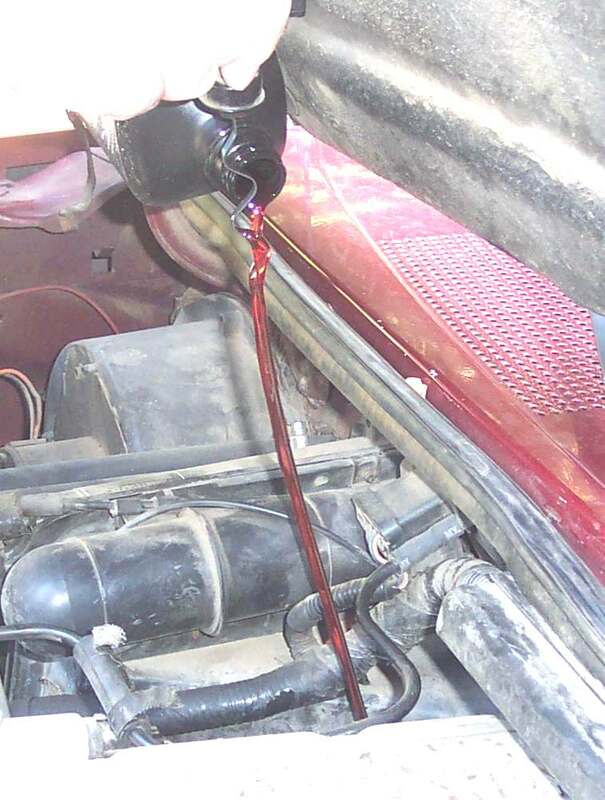 If it has a dipstick, you usually screw it in to check the oil level. As always, CHECK YOUR SHOP MANUAL. Adding oil can be a challenge. They never seem to make the fill hole big enough or in the right place. Lots of different funnels can really help here. You can Dribble oil down an Oil Dip Stick and into an oil fill hole. Sounds weird, but it works. If you change the oil filter, fill the oil up to the right level and then start the engine. Run it for about a minute, and then turn it off. let it sit for several minutes, to let the oil drain from the head, and check the level again. It will have gone down some as it fills up the oil filter, so you will need to add some more oil. Dry sump engines are a bit different from wet sump engines. On Dry Sump engines you will need to start and run the engine for five minutes or so BEFORE you check the oil level, if the engine has been sitting for any length of time. Even if you have just changed the oil, you will need to run the engine. This is because the oil tanks are all above the engine's oil pump. The oil is gravity feed to the pump. The oil will back feed through the pump gears and into the sump. The longer the engine sits, the more oil seeps back into the sump. You have to run the engine so the scavenging oil pump will pump all the excess oil out of the crankcase and into the oil tank. Once the crankcase is empty of oil and the oil tank full of oil, you can get an accurate oil level reading. Don't check the oil immediately after coming in from a hard run. Let it idle for a few minutes to stabilize the oil level in the tank. Remember to stand the bike upright to check the oil. Do not check it with it on the side stand. 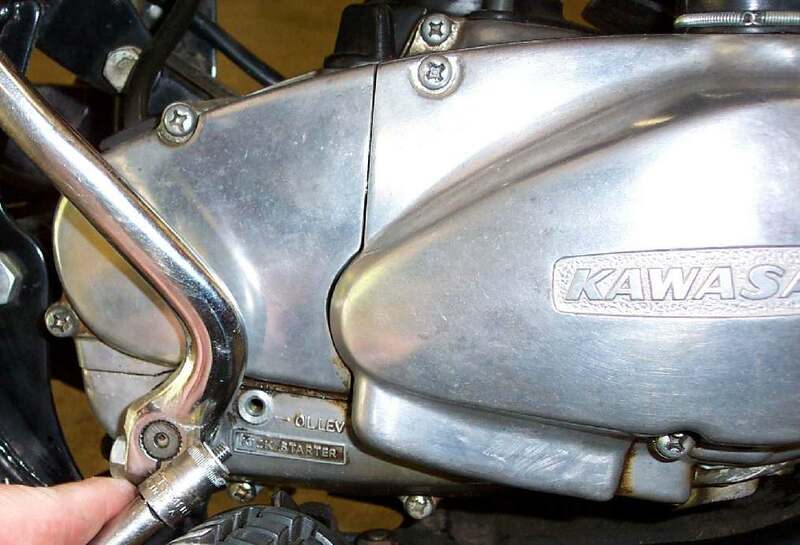 Some engines, like the Honda XR400R, have an additional crankcase oil level check bolt located under the oil filter and oil lines on the right side of the engine. 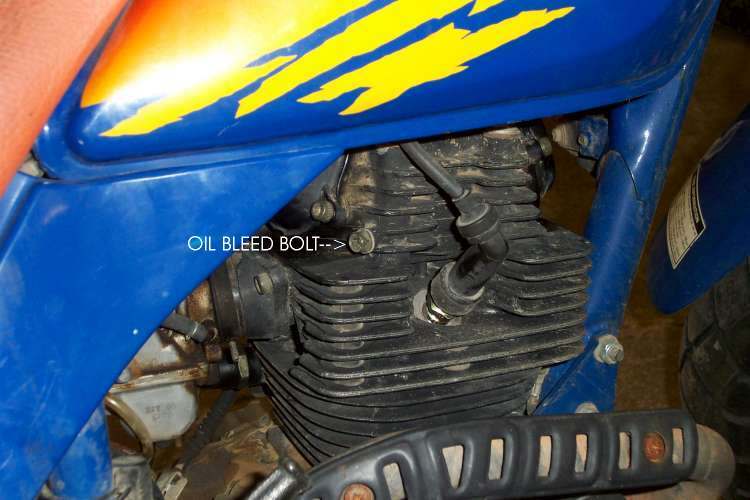 Start and idle the engine for a few minutes an then shut it off and, with the bike upright, remove this oil check bolt. Oil should be up to the threads in the bottom of the hole. Check your owners manual. I always like to check and make sure that oil is pumping to the head on four strokes. If there is no oil light, there often is an Oil Check or Bleed bolt. Loosen it while the engine is running and oil should come out of it. If there is no check bolt or oil light, and you still want to check, simply take a tappet cover off and start the engine. A lot of oil should spray out, so keep your finger on the kill button. If very little or nothing comes out, you have BIG problems. Look into it. You will notice that two stroke motors have no oil filters. That is because they have no oil pump. The oil is just in the transmission and all the gears are splash lubricated. The lubrication for the engine is handled by an oil injection pump or by pre-mixing the oil in the gasoline. The oil to the engine is always fresh, but you must change the oil in the transmission on a regular basis. Engines can be funny critters about oil levels. My RV has a Chevy 454 engine. It will sit at 1/4 quart low and stay there for many miles. If I fill it up to the top of the dip stick it will use oil till I stop refilling it and let it go back to the level it wants. I've seen bikes do this too. Check your oil a lot and you will soon see if your engine is using oil a lot or just wants to find it's own level.